We sat down with Michael Howie of The Everyday Fray Podcast to talk about how we use role-playing games in our social skills group here in Seattle and Kirkland. Michael is a great guy, and delightfully Canadian. His podcast focuses on mental health and his own personal journey living with a generalized anxiety disorder. 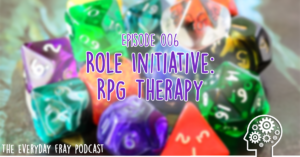 In the podcast we discuss how we describe our groups to parents, how we focus our game on real-world skills, and how we’ve seen the effects of our work. Check out more of the Everyday Fray Podcast here.